It’s not on the calendar yet (though I think it’s safe to assume it’s happening) but Pollstar reports that the Cold War Kids will be playing the Highline Ballroom on May 5, 2011 with Beast Make Bomb. Who are Beast Make Bomb you might ask? 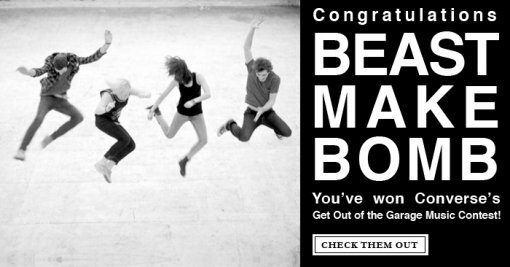 Beast Make Bomb recently won The Converse Get Out Of The Garage Contest and will kick off the six city tour with Tokyo Police Club and The Whigs in Austin for SXSW where they will play multiple showcases. From Texas they will hit Seattle, L.A., Chicago, D.C., and finish it off in their hometown of NYC at The Highline Ballroom with The Cold War Kids on May 5th. The band you know as Cold War Kids, on the other hand, are currently on the road supporting their just released third LP Mine Is Yours. The band will roll into town on Mar 24 with No Age and Baths to make its Radio City debut, good seats are still available. Highline Ballroom ticket info and more Cold War Kids and Beast Make Bomb tour dates after the jump. *Tickets available March 4, 2011. Make a $50 purchase of Converse shoes at participating Journeys and receive 2 tickets to the Get Out Of The Garage Music Tour. Gift with purchase at participating Journeys locations only. One set of tickets per customer. While supplies last. No substitutions.